Bees get wearable tech with tiny trackers #WearableWednesday « Adafruit Industries – Makers, hackers, artists, designers and engineers! Who said wearable tech was only for humans? 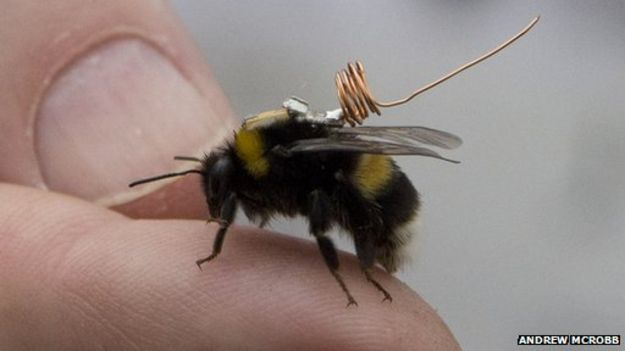 Check out these tiny trackers being used by ecologists in London to monitor bee behavior. Via BBC News. It is made from off-the-shelf technology and is based on equipment used to track pallets in warehouses, said its creator Dr Mark O’Neill. Readers, used to pick up a signal from the kit, are connected to Raspberry Pi computers, which log the readings. The device has a reach of up to 2.5m (8.2ft). Previously used models were restricted to 1cm (0.4in). The tracker consists of a standard RFID (radio frequency identification) chip and a specially designed aerial, which Dr O’Neill has created to be thinner and lighter than other models used to track small insects, allowing him to boost the range. The engineer, who is technical director at the Newcastle-based tech firm Tumbling Dice, is currently trying to patent the invention. “The first stage was to make very raw pre-production tags using components I could easily buy”, he said. The average “forage time” for a worker bee is around 20 minutes, suggesting they have a forage range of around 1km (0.6 miles) , Dr O’Neill explained. The idea is to have readers dotted around a hive and flower patch in order to track the signals as the bees move around freely in the wild. The tiny trackers, which are just 8mm (0.3in) high and 4.8mm (1.9in) wide, are stuck to the bees with superglue in a process which takes five to 10 minutes. The bees are chilled first to make them more docile. “They make a hell of a noise,” acknowledged Dr O’Neill. 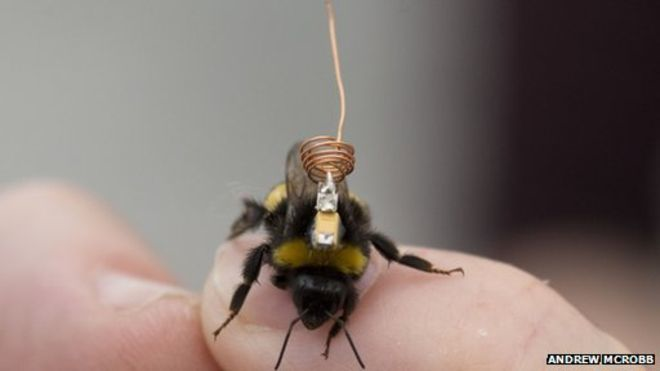 He told the BBC he hoped that the trackers – which weigh less than a bee and are attached at their centre of gravity so as not to affect their flight – would remain attached for their three-month expected lifespan. Ok I’m in, are you going to provide the details for this tiny tracker? I am in the process of building a hive monitor, a tracker for a couple of bees would make it above and beyond!